Many U.S. and European intelligence officials fear that a wave of terrorism will sweep over Europe, driven by the civil war in Syria and continuing instability in Iraq. 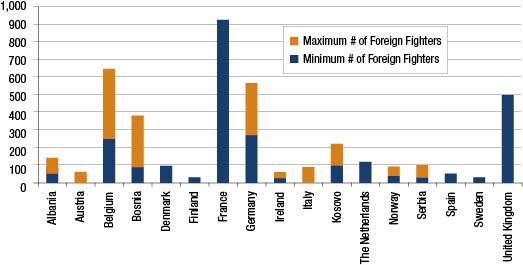 Many of the concerns stem from the large number of foreign fighters involved. • Many die, blowing themselves up in suicide attacks or perishing quickly in firefights with opposing forces. • Many never return home, but continue fighting in the conflict zone or at the next battle for jihad. • Many of the foreign fighters quickly become disillusioned, and a number even return to their home country without engaging in further violence. • Others are arrested or disrupted by intelligence services. Indeed, becoming a foreign fighter—particularly with today’s heavy use of social media—makes a terrorist far more likely to come to the attention of security services. The danger posed by returning foreign fighters is real, but American and European security services have tools that they can successfully deploy to mitigate the threat. These tools will have to be adapted to the new context in Syria and Iraq, but they will remain useful and effective. 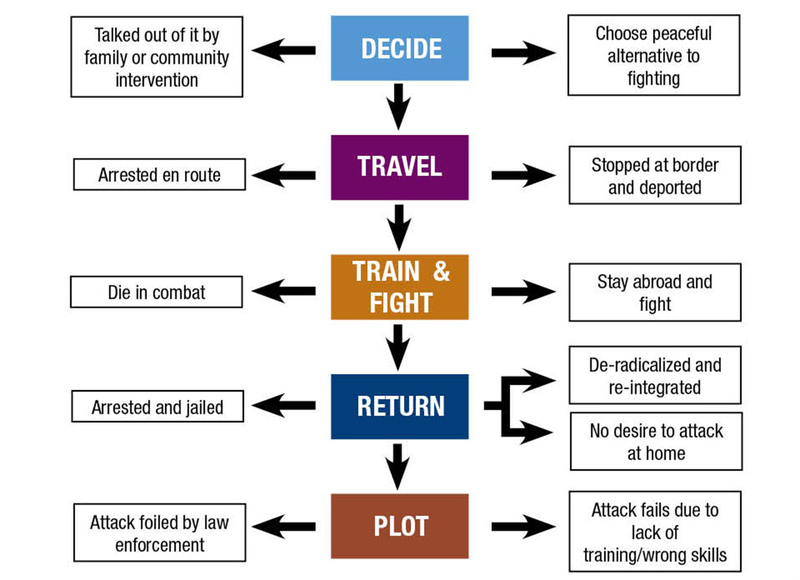 The model below shows how the various mitigating factors and effective policies can (though not necessarily will) lessen the danger presented by foreign fighters. First is the decision stage. It makes sense to reduce the numbers of those going to the conflict zone in the first place by interfering in the decision to go. After all, those who do not go cannot be radicalized by foreign fighting. Western countries should push a counter-narrative that stresses the brutality of the conflict and the internecine violence among jihadists. However, in general, governments are poor at developing counter-narratives and lack community credibility. It is usually better to elevate existing voices of community leaders who already embrace the counter-narrative than to try to handle this directly through government channels. Also vital is developing peaceful alternatives for helping the people affected by the conflicts in the Middle East. Some fighters—certainly not all but a significant portion—were originally motivated by a genuine desire to defend the Syrian people against the brutality of the Assad regime. Encouraging charitable activities, identifying legitimate channels for assistance, and otherwise highlighting what concerned individuals can do to help alleviate the suffering of the Syrian people may siphon off some of the supply of foreign fighters. Local programs for providing assistance can also improve domestic intelligence gathering capabilities in two ways, according to Western security service officials. First, simply being out and about in the community gives government officials more access to information about potential radicals. Families become comfortable with intelligence services, as do community leaders. Second, such programs allow intelligence officials to gain access to individuals who can potentially be recruited to inform on other would-be jihadists. • Talked out of joining the foreign militias by family or community intervention. • Choose peaceful alternative to fighting. The second stage in the foreign fighter radicalization process is the travel to Syria. Disrupting the transit route via Turkey is one of the most promising ways of reducing the threat of foreign fighters to Europe and the United States. Doing so will primarily require better cooperation between Western governments and Turkish authorities, who have not always seen stopping the flow of fighters as their highest priority. But as Turkish authorities are now becoming more worried about the jihadist threat to Turkey, Western security services should establish channels with Turkish intelligence and police to warn them of the presence of specific individuals headed to Syria through Turkey and to encourage Turkey to turn them away from the Turkish border or stop them at the Syrian border and deport them. Though there are other ways into Syria, all are far harder and more costly for Western fighters. Security cooperation among European services and between European and American services is also essential. Intelligence collected from the communications of foreign fighters, shared open source monitoring, and other information from one service can prove vital for discovering transnational networks. Cooperation within Europe is indispensable for stopping travel as jihadists from one European country often try to travel to Turkey and then on to Syria via another European country in an effort to avoid detection. • Stopped at border and deported. In the third stage of the process, the foreign fighters receive training and fight in Syria or Iraq, mostly out of the reach of European or American influence. But even here, there are subtle ways of influencing the terrorist indoctrination process. Western security agencies should do everything they can to sow doubt in the minds of extremist leaders in Iraq and Syria about the true loyalties of Western Muslim volunteers. Highlighting information gained from recruits and even disinformation about the degree of infiltration by security services can heighten fears. If jihadist organizations come to view foreigners as potential spies or as corrupting influences, they might assign them to non-combat roles, test their allegiances by offering them the one-way ticket of suicide bombings, or even avoid recruiting them altogether. • Die in the combat zone. • Stay abroad and fight. • Become disillusioned with the struggle. Upon the foreign fighters’ return, the fourth stage, it is critical to turn them away from violence and jihad. Western services report that they usually know when individuals return and that many return with doubts. As a first step, security services must triage returnees, identifying which ones deserve the most attention: our interviews indicate triaging is done inconsistently (and in some cases not at all) among the Western security services. Inevitably, some dangerous individuals will be missed, and some individuals identified as not particularly dangerous might later become a threat, but a first look is vital for prioritization. Efforts to promote a counter-narrative are valuable, particularly if they involve parents, preachers and community leaders. Community programs deserve considerable attention. The goal should be to move potential terrorists towards non-violence; since many are in that category already, hounding them with the threat of arrest or otherwise creating a sense of alienation can backfire. In the past, family and community members have at times been successful in steering returned fighters toward a different path, even getting them to inform on their former comrades. Indeed, sending returnees to jail for relatively minor crimes such as going abroad to fight with a foreign terrorist organization against a distant enemy may simply put them in prison for a few years and expose them to the radicalizing elements present in many European prisons, where many minor players become exposed to hardened jihadists and integrate into broader networks. • No desire to attack at home. To disrupt foreign fighters in the fifth and final stage of plotting terrorist attacks, security services must remain focused on the returnee problem and have sufficient resources to monitor the problem as it emerges in their countries. The good news is that going to Syria and Iraq and returning home usually does bring one to the attention the security services. But maintaining vigilance as the numbers increase will be difficult purely for reasons of resources. Marc Hecker, a French expert on terrorism, commented that France could handle the “dozens” who returned from Iraq but would be over-whelmed by the “hundreds” who may come back from Syria. Keeping track of that many suspects, is exceptionally resource intensive, particularly if it involves full-time surveillance. For intelligence services, often the problem is not in accessing or gathering the data, but in processing, analyzing, and following up on it in a timely manner. At the same time, their own effectiveness can work against them: by reducing the problem considerably, they decrease the danger, thereby creating the impression that they need fewer resources. One way to mitigate this effect is for security services to spread the burden of responsibility around by training and sharing information with local police and other law-enforcement and community organizations. Security cooperation among European services and between European and American services is absolutely necessary. Intelligence from the communications of foreign fighters, shared open-source monitoring, and other information obtained by one service can prove crucial for discovering transnational networks. As noted earlier, cooperation within Europe is critical for stopping travel, as jihadists from one European country often try to travel to Turkey and then on to Syria via another European country in order to avoid detection. • Attack foiled by law enforcement. • Attack fails due to lack of training or wrong skills. The United States and Europe already have effective measures in place to greatly reduce the threat of terrorism from jihadist returnees and to limit the scale of any attacks that might occur. Those measures can and should be improved—and, more importantly, adequately resourced. But the standard of success cannot be perfection. If it is, then Western governments are doomed to fail, and, worse, doomed to an overreaction which will waste resources and cause dangerous policy mistakes.